Measuring and managing – these two concepts go hand in hand. You can’t manage what you can’t measure, as the classic business adage says, and you also can’t see how well you’re managing without measuring on an ongoing basis. With power costs climbing, and the importance of good power quality on the rise, building owners and grid operators are seeing greater need for metering programs on both the supply and demand sides of electricity transactions. As Figure 1 shows, meeting all these needs requires metering devices in a number of locations throughout a facility and the connected grid. Specifiers need to understand both the goals of each specific metering installation, along with any standards that might be relevant to the location and purpose of the device. Figure 1: The main measurement applications in relationship to the supply side and the demand side. Specifically, today’s specifying engineers are being asked to address the major needs described below. In a series of posts, I’ll be going into each of these needs, in depth, describing goals and requirements. The following offers a brief overview of these applications. Cost allocation. The process that allows a facility manager to allocate energy expenses to their related internal departments or cost centers, such as manufacturing floors or data centers. Bill checking. The process that allows customers to check if invoice sent by energy suppliers or their representatives is correct. Energy efficiency and cost savings, energy usage analysis. The process that allows a facility manager to assign energy consumption/costs to zones (e.g., plants, floors and workshops) and to specific usages (e.g., HVAC, lighting, appliances and processes) over time, in order to optimize energy consumption and energy costs. Network monitoring, power availability and reliability, facility planning. The process that allows a facility manager to monitor its electrical installation in order to ensure availability and reliability of energy as well as asset durability. All these applications are covered by various standards, as specified in the below table. NOTE – Some devices are providing qualitative data, resulting from reduced acquisition performance or from simplified calculation algorithms. These approximate values are used for indication (e.g. current flowing or not), comparison (e.g. significant variation in consumption of an equipment between two time-periods) or estimation (e.g. low level of Power Factor) and cannot be compared to measurements provided by the above devices. IEC 61557-12 White paper Guide to using IEC 61557-12 standard to simplify the setup of an energy measurement plan. Fortunately, the growing need for meters to address all these applications (except billing applications) can now be met with a new generation of PMDs (Power Metering and Monitoring Devices) is coming to market. 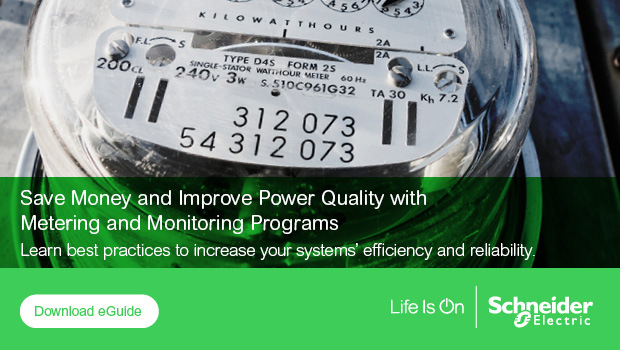 Schneider Electric is leading the industry with its PowerLogic PM8000 Series, with models designed for key metering points throughout a facility’s energy infrastructure. We invite you to learn more about this versatile line-up on our website.